In this guest post, I talk about how to develop a project cost estimator that lets you estimate the cost of a project in minutes. I focus more on the technical side of things because the audience for StatEase’s blog is different than for Small Business Decisions. 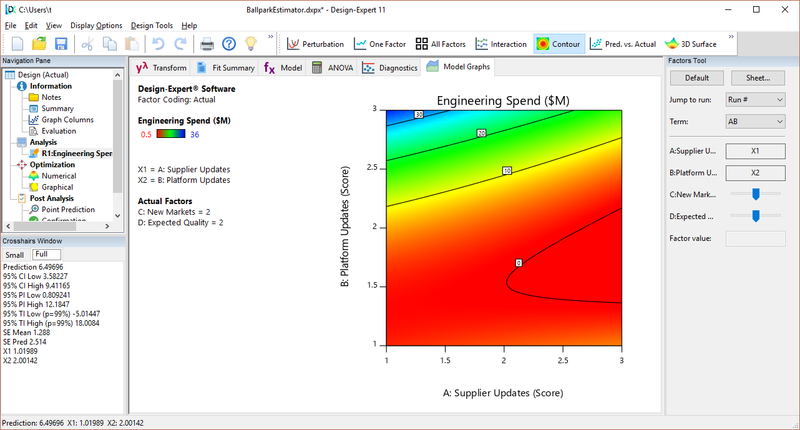 Stat-Ease is one of the world leaders in the predictive statistics fields of Design of Experiments and Response Surface Modeling. My approach is to apply their tools to business scenarios, rather than the scientific, chemical, or pharmacological fields they were designed for. Since I am using their tools in a new field, they have graciously agreed to work with me on a few topics. Lead engineers are incredibly overworked and their time is disproportionately valuable compared to some more junior engineers. But when it comes to doing project cost estimations, we don’t have much of a choice but to ask some of these high-value engineers for the estimates if we want a realistic level of accuracy. Plus, the unfortunate reality is that many project costs end up being too high to justify the screening business case, so the project is canceled, and the high-value engineering time is wasted. I found a unique solution to this time sink using RSM to create a Ballpark Project Cost Estimator.